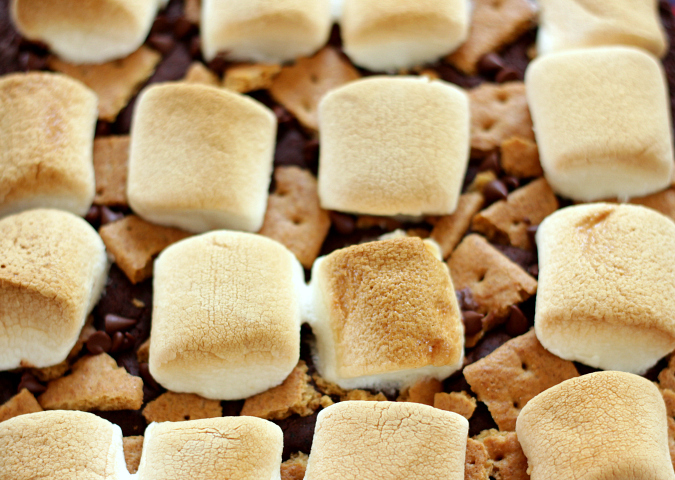 when i think of the fourth of july, s'mores come to mind right away. without a doubt, they are a classic summertime dessert. for our family's fourth of july cookout over the holiday weekend, in addition to making red, white, and blue confetti cupcakes for dessert, ryan and i also made s'mores brownies. these brownies are a fun twist on classic s'mores which can be made in advance (unlike traditional s'mores) and enjoyed by a group. ps: speaking of s'mores, remember my s'mores cake from a few years ago? that was one of my favorite birthday cakes ever! preheat your oven to 350 degrees F and grease a 8-inch square glass baking pan. in a double boiler, melt the butter and the chocolate. once melted, remove from the heat and stir in the sugars. allow to cool slightly. whisk the eggs and stir them into the melted chocolate mixture along with the vanilla. in a separate bowl, sift together the flour and baking powder. stir in the melted chocolate until combined. 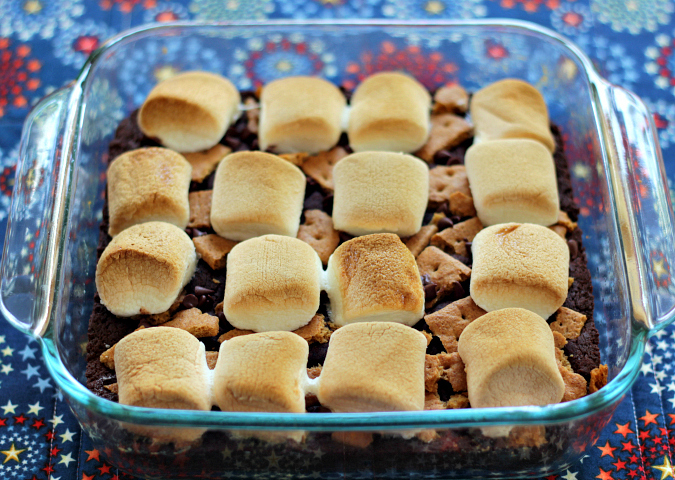 pour the batter into the prepared baking dish and top with the crushed graham crackers and marshmallows. bake for 20 minutes, until the marshmallows are browned and puffy. cool before slicing and serving. The brownies were very good and not too sweet.